What a tremendous spring, summer, and fall we had for photography! I apologize for the lack of posts here and the only reason is an excuse. - Busy, Busy, Busy with weddings, portraits, and some personal items. This will be a quick post but as we go into the winter, I plan to return to at least one post per week. The holiday season is upon us and many photographs will be taken. Take the time to capture the memories your family will want to hold and cherish. However, do not forget a few important items. Too often the images are posted on-line to Facebook and many other social networking sites. However, they are never printed. It almost appears to me that folks believe that these places will be around for our viewing pleasure 20-50 years from now. Although there is a chance they will be around, I doubt that they will be in the same format that we see them now. My concern is that many of these memories will be lost if they are not printed. Please take the time to make prints. My favorite print for this year is the thin wrap with satin metallic finish (other than albums and brag books - more on these items in the future). Typically, I use Bay Photo for my prints (both professional and personal work) and ACI labs for my albums and brag books. The second point is that WE (that take pictures) are not included in the images. Take the time to have someone else get a photo of you or put your camera on a tripod and fire away. 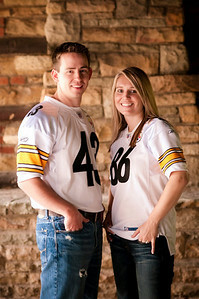 Below is an image from a recent wedding engagement session. The great looking background is the interior of a building at a local park. I constantly look for new places to take portraits and I am amazed how many are available at local parks. Do the same thing in your area. As you drive around, notice the lighting, textures and other areas that might make a great family photo. I plan to post more over the next few months with ideas and tips for photographing your family at these locations. The couple was lit with a combination of available side light (camera left) and some fill light from an off camera flash (SB800) through an umbrella mounted on a light stand (camera right). For many of my portraits I am now using two different lenses. Nikon 35mm f/1.8 and the Nikon 85mm f/1.8. The sharpness and speed of these two lenses have made them my favorite portrait lenses. Typically, shots of more than one individual I am using the 35mm (unless I want the background to blur out and disappear) . Recently, I did a group photo of over 15 individuals using the 35mm with great success. I plan to discuss this great little lens in future posts.